Meet Lauren Lozano Ziol and Michelle Jolas, the dynamic duo behind Chicago-based SKIN Interior Design. Known for their ability to both highlight the classic bones of an interior while breathing modern life into a space; they recently transformed a jaw-droppingly beautiful home in San Francisco’s Presidio Heights neighborhood. We collaborated with them on this monumental project to modernize their client’s extensive collection of European antiques and transform unique vintage finds to harmoniously blend with the house’s classic architecture and intricate details. Read on to learn about this stunning project with SKIN! How do you start your design process with a new client? We start by reflecting on our clients’ preferences, personality and budget. Then we dive into researching furniture and design history, the newest wallpapers and fabrics, and we shop and get inspired by what we see. We then start to create a design vision connecting our ideas with scale and architecture, pattern, texture, art and ambiance. The layering is the final component that pulls it all together. Let’s talk about your vision for the home! Overall, what were some of the themes you wanted to evoke with the decor of the home? The house is in one of San Francisco’s most beautiful neighborhoods and has stunning views. One of our first discussions with the client was about how to bring indoors the beauty of their outdoor surroundings. The views of the Golden Gate Bridge, the lush Presidio, the expansive sky and the San Francisco Bay set the palette for the home - rich blues, greens and fun accents colors. We wanted to honor the classical architecture and evoke a sense of grandeur and glamor but with a twist of fun. 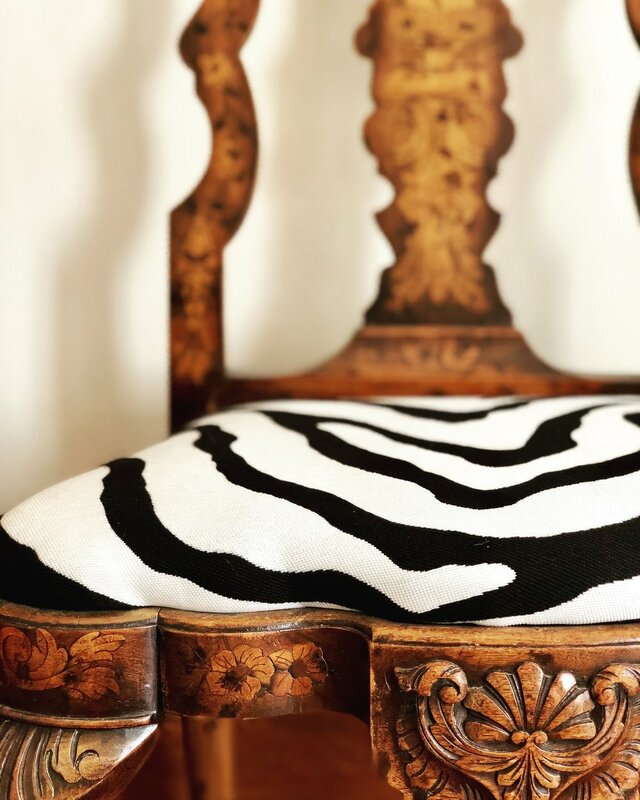 Our goal was to preserve our clients’ more traditional taste, yet add fun unexpected pops of color and pattern and use black and white accents throughout to make the design feel fresh. Ultimately we wanted the home to feel refined yet approachable to fit our clients’ lifestyle. What were some original elements of the home you wanted to highlight? As an example, the stair hall with its classic architectural details and stained glass windows was brought to life with the modern striped black and white Missoni runner, anchored by the old-world brass stair rods that we discovered at Hôtel Costes in Paris. In what ways did the furniture you selected complement the architecture? And in what ways did the furniture modernize the home? Our client already had so many beautiful antiques! We started by revitalizing most of their original pieces with unique and colorful fabrics for a bold refresh. We also purchased some antiques and vintage pieces that reflected the grandness of the home. Do you purchase vintage and antique with the intent to revitalize? Yes! We can always see our vision and see what the piece can be as it takes on a new life. Paint and hardware, fabric and details can really shock you when a piece is finished. What’s your favorite room in the whole home? The room we call The Bar. The boldness of the custom teal colored lacquered walls, the art, the custom-designed, curved sofa in front of the bay windows - the whole room is so sophisticated and swank, yet cozy. Of the many pieces you revitalized in this home, which were your favorites? The living room sofa is actually a vintage piece we found on Chairish; we fell in love with it because it looked so 60’s and right out of an Audrey Hepburn movie! We call it the Dorothy Draper sofa (one of our all time favorite interior designers). The vision for the sofa came to life when we chose our paint color for The Bar, which you see when sitting on this sofa. We selected a vibrant, teal mohair with a tonally similar, silky fabric for the welt; it is so chic! The team at Revitaliste helped us design the perfect skirt and refine the other upholstery details to perfection. The stair hall settee was really in need of repair inside. Revitaliste reworked the bones to create a “like new” settee with a lush down seat cushion. We chose this incredible peacock motif fabric from Schumacher (“ Peacock” in emerald color way) that instantly spoke to both the client and to us. We lacquered the ornately carved frame in a black semi-gloss to add more drama to the piece. The pair of French armchairs were found locally at Art and Antiques Exchange. The shape and scale were to die for. The crewel fabric we chose worked insanely well with our color palette and was so beautiful. They are such a lovely contrast to the teal mohair sofa and the teal accents of The Bar - and they add a fun pop of color and whimsy in the living room. Tell us about what it was like to work with Revitaliste. Collaborating with Revitaliste was a true dream. Since our firm is based in Chicago, having the Revitaliste team on the ground in San Francisco coordinating all the details was so helpful. 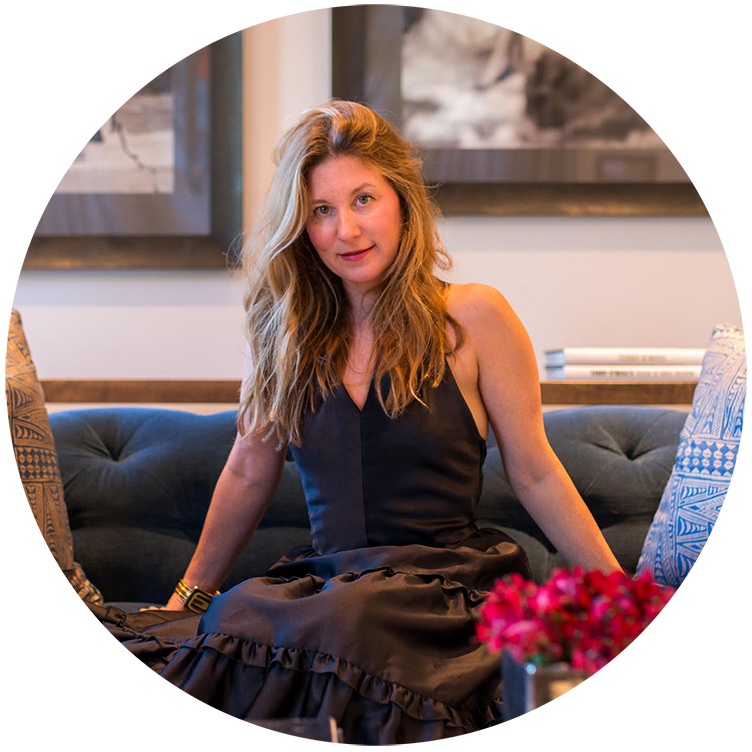 Their artisans are so talented and Revitaliste founder, Amy, is a powerhouse who knows everything about upholstery and refinishing. The team's knowledge of fabrics and how they work is exceptional. We are so excited to work with Revitaliste on future San Francisco projects. Currently, they are helping us in NYC as well and once again the work is perfection. Design Insider Q&A: Get to know Team SKIN! What’s a decorating trend you’re currently liking? We love French 40’s, Maison Jansen, Mid Century Masters, but our look is really to incorporate both vintage and modern, mixing periods to create a fresh look. We also love using clean lines with unique one-off pieces. What’s your favorite paint color? Who’s your ultimate design or style icon? Miles Redd and Milo Baughman. What era are you most inspired by? French 40’s and their use of many materials such as shagreen and vellum. Inspired by SKIN's gorgeous Presidio Heights project? With Revitaliste’s one-stop service (including upholstery, refinishing, lacquering, powder coating, and much more) you can transform your furniture into one-of-a-kind treasures or simply give beloved pieces a quick refresh. To make revitalization a breeze for you, we manage the entire process—from pick-up to delivery and every step in between. Our network of skilled artisans are the best in their trades, so quality is 100% guaranteed. We welcome you to get in touch for an estimate!